Eleven-year-old Charlotte loves reading about adventures on the high seas and dreaming about finding gold nuggets on the Otago goldfields, but soon she'll have to stay home and help her mother with the household chores and Charlotte's younger siblings. When Charlotte's friend Cyr... read full description below. 'I'm sure it'll be much more fun at the goldfields'. Charlotte loves to play marbles with her best friend Harry and read about adventures on the high seas. But Charlotte will have to leave school soon and help her mother with the house and the younger children. Charlotte can't imagine anything worse. When it looks like her mother is going to keep her home for good, Charlotte and her new friend Cyril board a Cobb & Co coach and head to Hogburn Gully, where the Otago gold rush is in full swing. But the mining town isn't what Charlotte imagined. 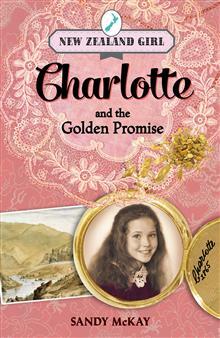 Can Charlotte find a fortune in the goldfields? Or will she have to return home to a narrow life of sewing, cooking and looking after her little sisters? Sandy McKay is an experienced writer for children; she is the author of over 12 titles, most notably, Recycled, My Dad the All Black, Who Wants to be a Millionaire?, Losing It and One Stroppy Jockey. She was the recipient of the Dunedin College of Education Writer in Residency in 2001, and her books have been short-listed for the NZ Post and LIANZA awards and listed as Storylines Notable Books. Sandy won the Junior Fiction Category of the NZ Post Children's Book Awards for Recycled. Her landmark book, Losing It, was short-listed for the Esther Glen Award and dramatised by Radio NZ. She also writes for younger children, having three titles in the popular Penguin Kiwi Bites series. (I'm Telling on You, Barry and Bitsa, and Me and Jason Ballinger) as well as titles in the Walker Books series (Mr Tripp Smells a Rat, and Mr Tripp Goes for a Skate). Sandy's junior historical novel When our Jack Went to War was published in 2013. Sandy lives in Dunedin with her husband Craig, daughter Meg and a high spirited spaniel called Lucy. They also have two adult sons who live 'not too far away'. She enjoys writing books that are accessible to a wide range of ages. And when not writing, she works as an adult literacy tutor.